As a member of the Karakuri Group, when I renewed my membership at the start of the year I decided to pick up a few of the DIY kits that they offer. After my experience with Bruce Vinney's designs I was interested to see what Karakuri Group had created, and also to better understand the mechanisms used, which is one of the goals Karakuri set when making the kits. When I mentioned that I had the kits on one of the puzzle forums, there were requests to show how to build them, so much like I did with the previous kits I built, I decided to show the build process in full. Watch the video below to see the build, and watch the kit come to life. In the video I'll cover all the tools I use and this isn't time lapse so you can see everything in real time. I'll be doing videos for all the kits shown in the video, so check back for more soon. The first of the kits I built was (as you already know from the title of this post) the Kakukaku Box. I picked this one for no other reason than liking the look of the box. Interestingly it was the last of the four that I picked, and really the only reason was that I had set a budget and this fit within that budget after having picked the three others I wanted. As you can see from the picture above, the box itself is fairly simple. The ply is visible on the top of the box, but personally I don't think that's an issue. If you don't like having the ply exposed, you could glue some veneer onto the top panel just to make it neater. 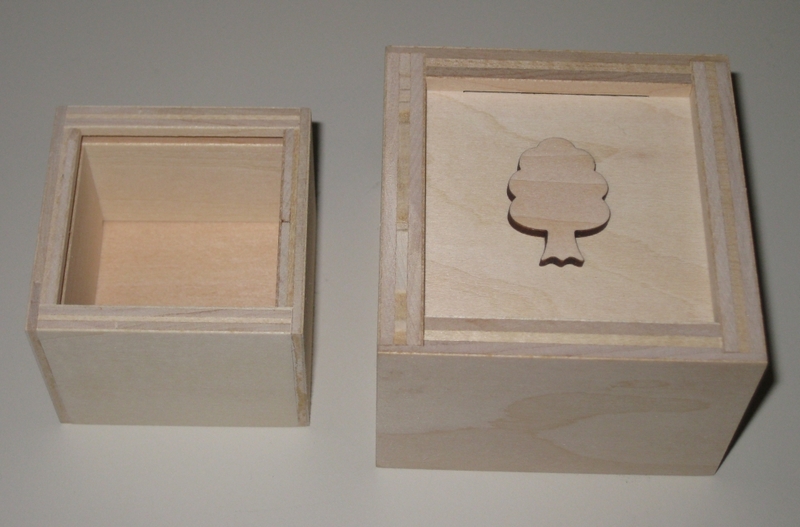 The laser cut tree certainly adds to the look of the box, and is also a clue as to the solution. Building the kit was fairly simple. The diagrams on the build instructions are very clear, and there's nothing complicated to this kit, so I didn't have any issues building it. The video is real time, so it took about 15 minutes to put together, and would probably be quicker if you're not recording a video and talking through everything you're doing! As far as the puzzle box itself is concerned, I'll be honest that I was a little disappointed with the box. I have two reasons for this, and at first they seem contradictory, but bear with me. The locking mechanism is both too difficult to open, and too easy to open at the same time. If you attempt to open the box using the 'solution' provided, it can be very difficult to move the two parts of the box in the right way to get them to open. The fit is pretty good, and as such the movements need to be made very precisely to get the box open. Sadly, there is a much simpler way to open the box. If you hold the top of the box, and shake it, the bottom falls out on its own, making it far too easy! As a kit I certainly enjoyed building it, and you will understand the mechanism once you've built the box, so it certainly meets the expectations that the Karakuri group set out to achieve. 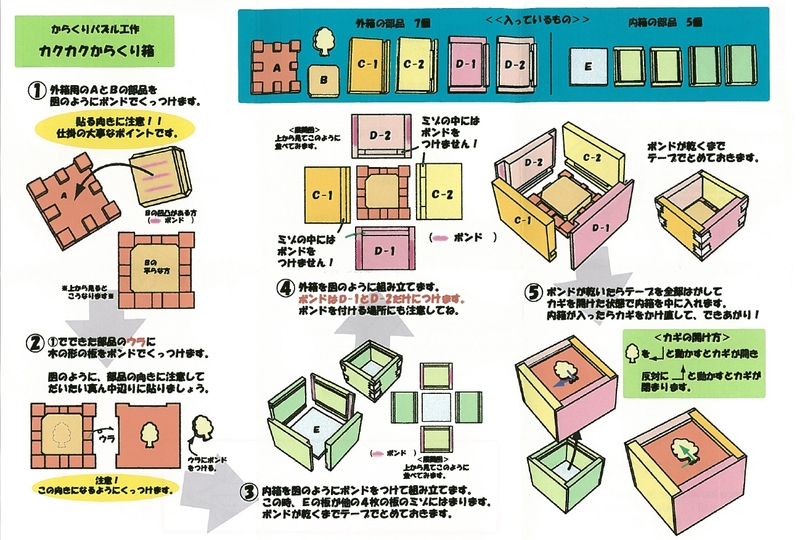 If you're thinking of buying one (or more) of these kits, I'd say that there are better boxes in terms of the end puzzle that you could get, but if you just want to add them all, then go get it! Take Piece 'A' and lay it as shown in the diagram. The sides with the notches cut out should be at the top and right of the piece as you look at it. Take Piece 'B' and glue it into the centre of piece 'A'. The piece fits snugly between the wooden blocks that surround the piece, so no adjustment or fine placement is required. Make sure that the lip on piece 'B' is on the left and top as you look at the piece. This can be confirmed by the angled corners as seen in the diagram. Once the top of the box is dry from step 1, flip the piece over so that the cut away sections are now on the top and left of the piece as you look at it. Using a ruler, mark the centre of the piece, making note of the cutout which will not be seen once the box is complete. With the centre identified, glue the tree piece to the centre as seen in the diagram. Take the parts labelled 'E' in the diagram. The flat square is the base of the inner box. There are two sides with notches cut in each end, and two with no notches cut. Place the base in the centre and then around that the two pieces with notches in the ends above and below it, then the two without notches at either side as seen in the diagram on the right. You will notice that there is a grove running through the with of all of these pieces. The base will go into one of these slots, and the other is part of the locking mechanism. Put glue into the notches on either end of the top and bottom pieces and using a brush, spread the glue evenly into these notches. Bring all four sides together around the base as seen in the lower left diagram. Once all four pieces have been brought snugly together, tape the corners and check that the corners are square using an engineers square. Note: This check is not really needed as the pieces are designed to give a good square corner. Note: You can put tape on the corners before adding the glue. This can make the job of taping the corners easier rather than trying to get tape around the corners after they are in place. Leave the inner box to dry. Take the top which was completed in step 2, and place it as seen in the diagram, where the cut-out sections are at the top and right of the piece as you look at it. Taking pieces Labelled C-1, C-2, D-1, D-2, place these around the top as seen in the diagram. Pieces D-2 and C-2 have a piece of wood inside the groove which ensures the pieces are correctly located in relation to the locking mechanism, and the centre of the box. Pieces C-1 and D-1 have no insert in the groove, and will slide freely along the length of the top. Apply glue into the notches on either end of pieces D-1 and D-2 and using a brush, spread the glue evenly into these notches. Bring all four pieces together around the top as seen in the diagram on the right, starting with pieces D-2 and C-2 which will ensure that the pieces are correctly centred. Once all four pieces are in place, tape the corners together and allow the top to dry. You can check the top for squareness before it is dry however as with the inner box, the pieces are designed to give a good square corner even without this check. To Close the Box, place the outer box onto the Inner box and move the top Right and Up as per the green arrow in the diagram. The box is now locked. Top Open the box, move the outer box Down and Left as per the blue arrow in the diagram, then lift the top of the bottom. The box is now open.